Trust me to decide on doing a new series for the blog today with practically no fruit in the house… I have been toying with the idea of doing a ‘Smoothie / Slushie Sunday’ blog series for a while now and whilst prepping my fruit for a smoothie today, I decided to take a few photos. This is not the most interesting smoothie recipe you will ever see, but it’s delicious nonetheless. Smoothies and I are BFFs, I love making my own smoothies… If you follow me on Instagram, would have probably seen a photo or 2 of my homemade smoothies. I don’t really order smoothies when I go to restaurants, because I can’t control what goes in there (I don’t like smoothies made with ice cream or frozen yoghurt). I love Kauai smoothies though – Mango Bang is my all-time favourite! Don’t worry, I’m not all of a sudden going to be a food blogger. But we all know fresh fruit and veggies do wonders for our skin and overall health. And we all want healthy, glowing skin – no one wants to have to cover up their skin with mounds of foundation and concealer. Well…I know I don’t. So for today’s smoothie recipe I worked with what I had in the fridge and pantry & it turned out pretty yummy! The amount of ingredients below make about 500ml of smoothie-deliciousness. Add all the ingredients to your blender. I usually add the ice cubes last as their weight pushes everything down towards the blades. Plus, you might damage the motor of your blender if you start with the ice cubes at the bottom. Whizz the ingredients together for about 20 seconds. If you like your fruit to be more chunky, blend for less amount of time. The almonds and dried cherries add a nice bite to the smoothie. Yum! 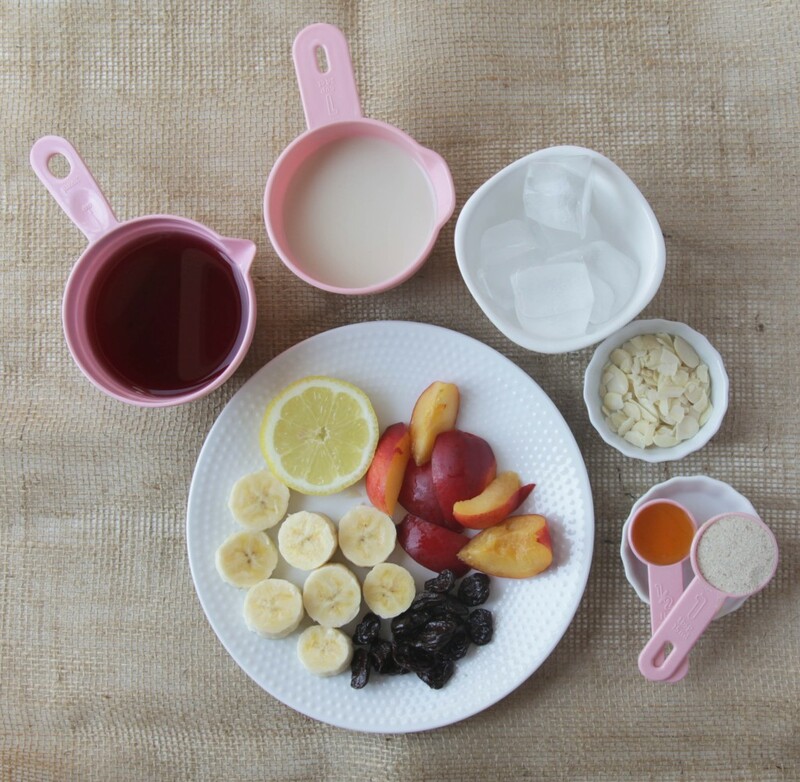 ♥ Bananas are rich in Vitamins A, B & E thus it works as an anti-aging agent. ♥ Almonds contain Vitamin E which helps nourish the skin and protect it from the sun’s damaging UV rays. ♥ Cherries are endowed with the highest level of anti-oxidants, this means they help to slow down the aging process. Cherries also provide nourishment to the hair. ♥ Psyllium Husk is an all-natural fiber product that will keep your body regular (you don’t have to add this to your smoothie though). It doesn’t add any taste to the smoothie, don’t worry. I bought my bag at Dischem. Ohhh I love this. Great post and that smoothie looks delicious. I will have to pull our smoothy maker out. I love homemade smoothies too. Thanks for popping on to my blog, Michelle! And for all the love you give my blog! 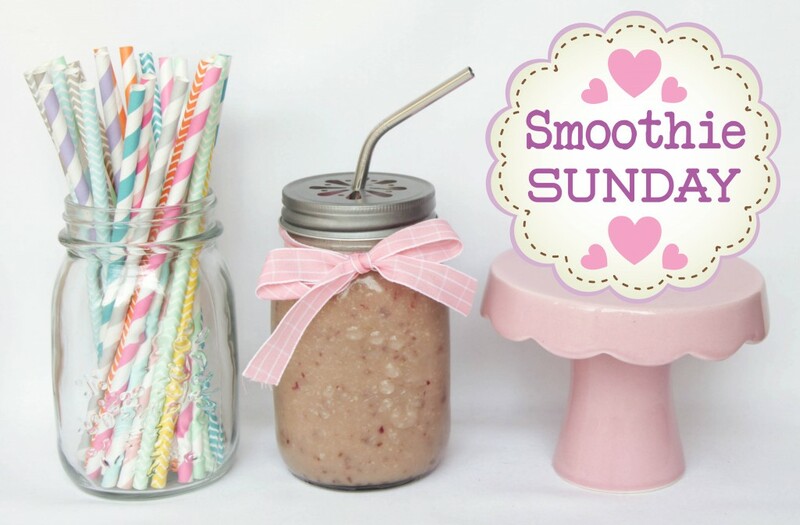 What a cool idea to post smoothie recipes. I want to start making smoothies and this post was just the motivation I needed. Thank you for the great instructions! Thanks, Rhondine! x I bought them from In Good Company – they’re lovely! Yum…I love nectarines so this smoothie sounds right up my alley. This is a great idea, Luzanne, you have the best ideas. Its nice to read something different. Dont get my wrong, I love beauty things but something different every now and again is wonderful. Can’t wait for more smoothie recipes!! Sounds healthy and delicious! Love the cute photo! Yummmy! Looks delicious! Where did get that bottle smoothie jar from? I so want one. Hi Nicola! 🙂 I bought them from In Good Company (they have an online shop too).